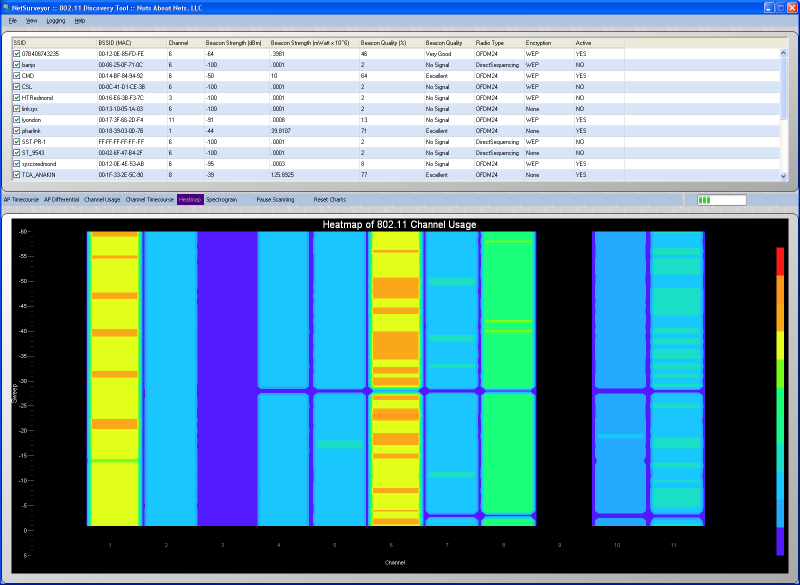 NetSurveyor is a diagnostic tool that falls under the category of WiFi Scanners or 802.11 Network Discovery Tools. The best known in this category is NetStumbler. 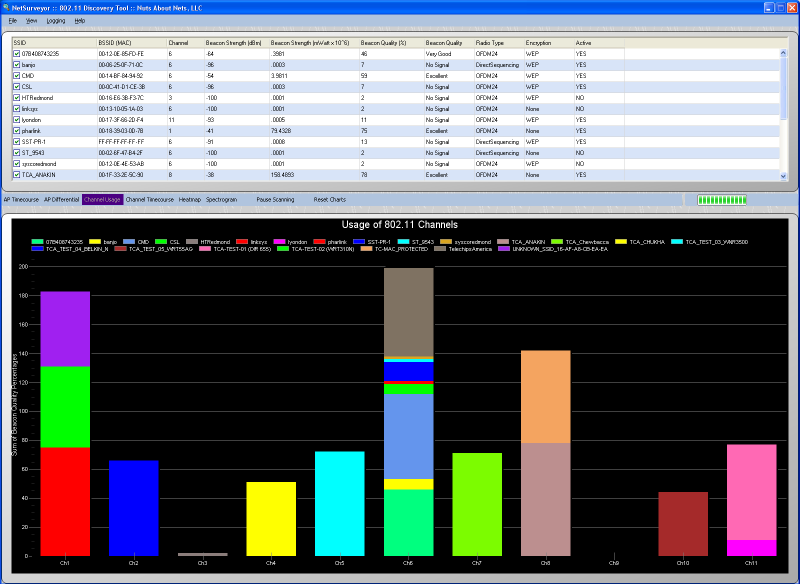 A discovery tool reports the Service Set Identifier (SSID) for each wireless network it detects, along with the channel used by the access point (AP) servicing that network. The way this works is that roughly every 100 mSec an AP sends an “I’m here” beacon – and the discovery tool (running on your laptop and using its 802.11 wireless adapter, also known as a station or STA) picks-up that beacon and adds the SSID to its list of known wireless networks. In addition, the discovery tool reports the RSSI (Received Signal Strength Indication) for each AP, which is roughly an indication of how close the AP is to your current location (i.e. how close it is to the client STA). Just to be clear, the RSSI reflects the strength of the beacon as received by the STA – it is	not an indication of performance. 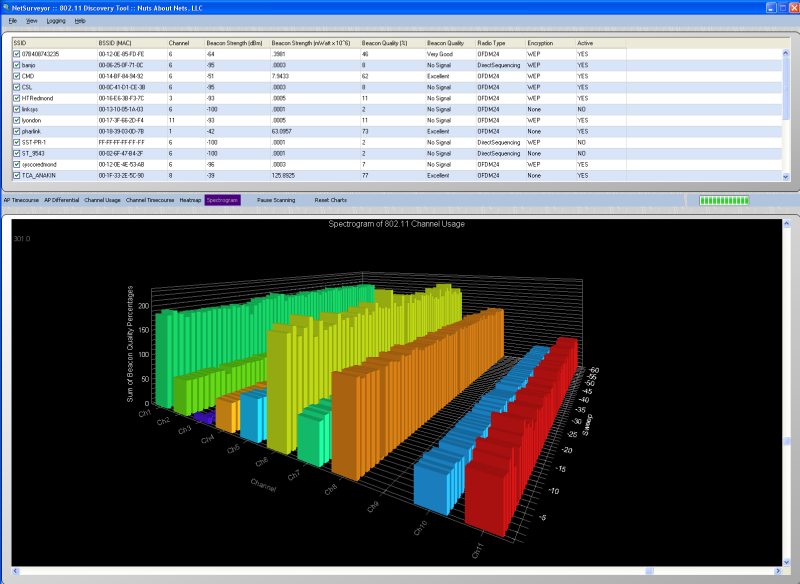 In addition to the grid that repeatedly updates information about each access point, there are 6 graphical, diagnostic views: (1) Timecourse of Beacon Qualities For Each Access Point, (2) Differential Display of Beacon Qualities for Each Access Point, (3) Usage of Each of the 802.11 b/g Channels, (4) Timecourse of the Usage of Each of the 802.11 b/g Channels, (5) Heatmap / Waterfall Chart of the 802.11 b/g Channels and (6) Channel Spectrogram of the 802.11 b/g Channels. The more (and different) ways you have at looking at data then the greater the chance something will catch your eye that you might otherwise miss if only a single type of chart were used. Generates reports in Adobe PDF format that include the list of access points and their properties along with images of each of the 6 diagnostic charts. Powerful and innovative logging and recording capability. Other products, if they even offer a recording/playback feature, usually follow the “tape recorder” paradigm. NetSurveyor's playback mode is unique in that it shows you all the recorded data – that is, you do not press a ‘play’ button and then forced to watch minutes or hours of data scroll by in the hope that some unusual event will catch your eye. NetSurveyor’s unique approach makes reviewing recorded data a snap. If your laptop or PC has multiple wireless adapters installed – not a problem. When NetSurveyor launches it detects each of these and asks you to choose which one to use for that session. Supports most all wireless adapters – that is, those that are installed with an NDIS 5.x driver (or later). This would include wireless adapters running on Windows XP, Vista and Windows 7. Can be run in ‘Demo’ mode – so, even if you don’t have a wireless adapter attached to your desktop or laptop machine you can still experiment with the application to see whether it suits your needs. NetSurveyor is distributed as freeware and does not require a license. You are free to download it and use it on as many machines as you like.